A few seven inch sleeves I did for Native Records in the 1980s turned up in a box the other week. Quite strange to look back on the covers and try to remember how they were done. 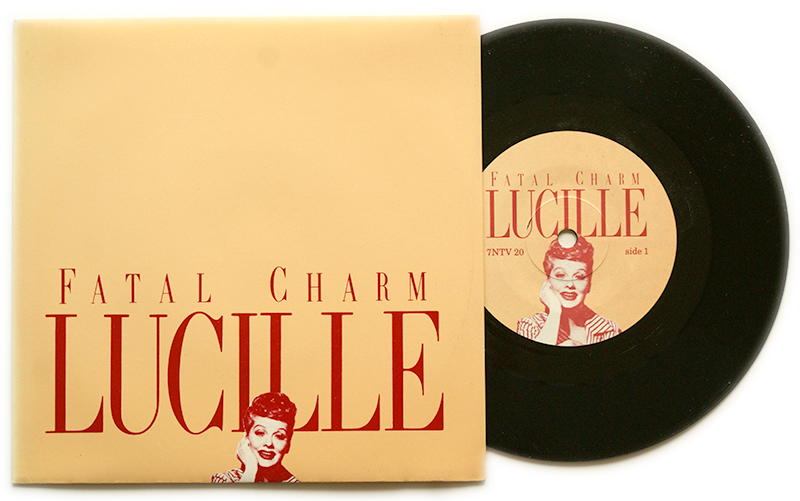 Lucille was a track inspired by the American female comedienne from Nottingham based band Fatal Charm, issued in 1987. 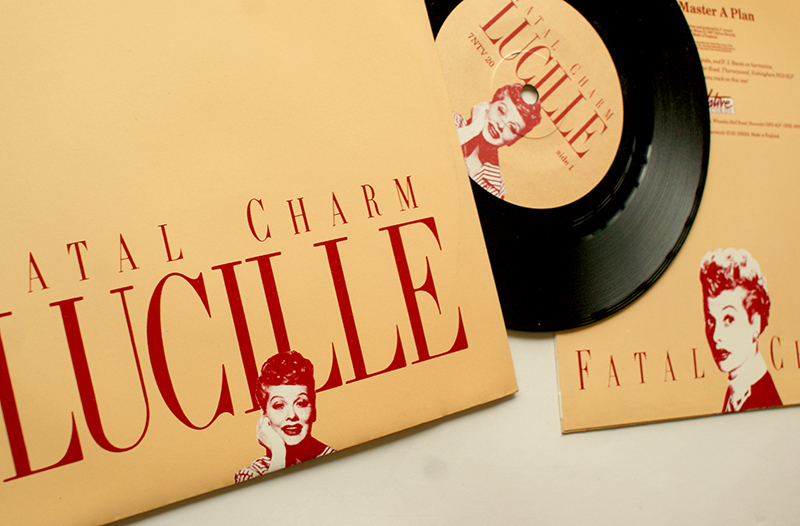 I found the photos of Lucille Ball in some old Picturegoer annuals. The cover had to be kept to just a couple of colours for budget reasons, and the red was a reflection of her trademark lipstick colour. The serif typeface had been used on their last single (I think I took it straight off a Letraset catalogue. I did the previous sleeve in a bit of a hurry. I’d come up with a shot of someone setting fire to themselves for the cover but it was a bit too political for them!) so was retained to give some continuity. The band had been going a few years but the two singles they did for Native made the indie charts. 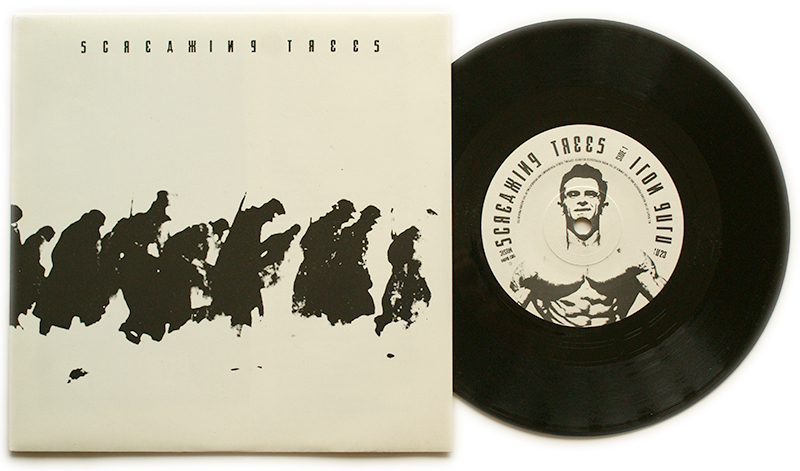 Screaming Trees are not the US early industrial outfit, but a pair of lads from Barnsley who never achieved a high enough profile to trouble their more famous transatlantic namesake’s lawyers. Produced by ABC’s Stephen Singleton, they always sort of knew what they were after and were into a lot of vintage cult movies. The type for this 1987 single was again just made up from old Letraset catalogues to give that vaguely Russian feel which they were after, and then laid out on board and recopied on one of those large reprographic cameras. The fun job was trying to curve the type round for the label! They came up with the image for the label, and I think I found the shot of retreating German troops on the Russian front for the cover. I also did the band shoot for the back sleeve in the woods somewhere in Sheffield. Again just a single colour to help keep costs down. Amazingly 45 people are searching for this single on Discogs.com. There was also a 12″ with a different sleeve. And a poster, which never got printed. And then a 12″ remix a year later which I think The Designer’s Republic did the cover for (they nabbed the work off me!). 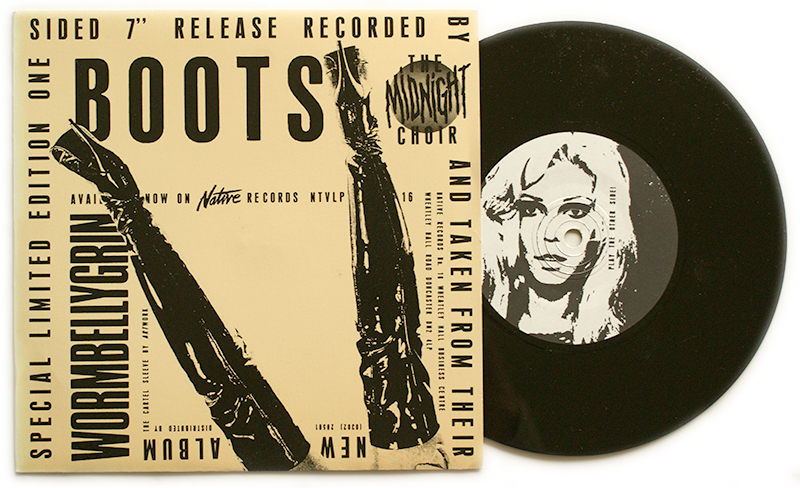 Lastly a sort of promo single for another Sheffield outfit, The Midnight Choir. They had an album released in 1986, which I did the artwork for, using one of their own found images and band logo. The label thought this version of the Nancy Sinatra track might get a bit of indie radio interest, so I had a couple of hours to come up with a cover. The latex boots was an obvious image when I found the reference shot in some iffy magazine or other. Then having roughed out the lettering to make a sort of spiral and getting the typesetters to play it out, I spent hours trying to get it all to fit. A picture of Nancy was used on one side of the disc to warn people it was blank. All these were done as artwork on board, it was pre-Mac days. I’ve no idea how the label worked in terms of sales on singles like this, most of the projects were subsidised by their main work as an indie strike force promoting new release by other bigger labels. But at least there were routes to try stuff like this and enough indie shops to take the releases.